A nice streamline design, this Admiral has a striking white cabinet and an interesting glass slide-rule dial with a brass dial escutcheon. 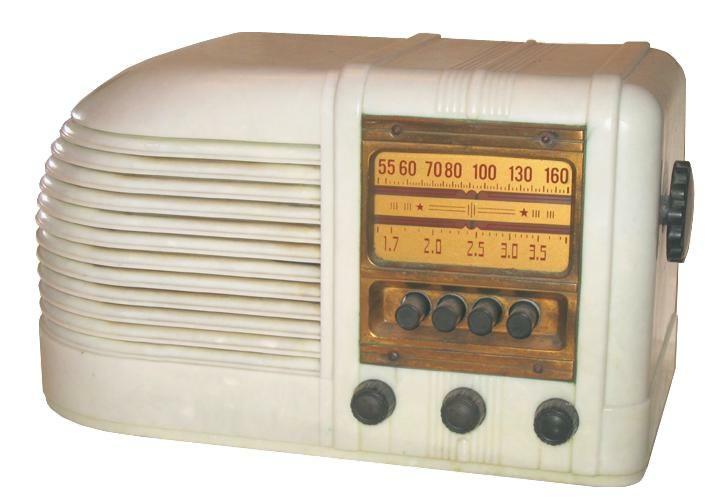 In contrast to the more common All-American Five (AA5) radio designs that had five tubes, this Admiral is an AA6 design that is basically an AA5 with an additional 12SK7, which serves as an RF amplifier in the front end. For Admiral radios from around this era, the first 3 digits in the model number before the dash most likely represents the cabinet and dial configurations. The 396-6M is walnut brown bakelite, 397-6M is plaskon, and 398-6M is beetle plastic. The chassis model for technical information are the digits after the dash in the model number. The chassis model 6M for this Admiral can be found in the Rider schematics under Continental Radio & Television Corp.